In its press release, Western Railways said that the tragedy was caused due to the unexpected rainfall, which created unusual crowd at the exit point. The railway release further said that the rumours of the foot-over bridge breaking down further fuelled panic. 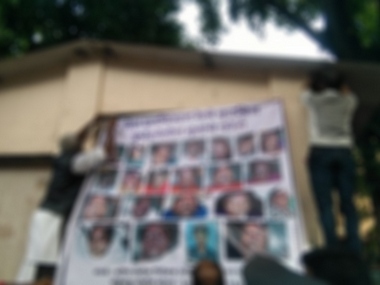 Did Mumbai Police use its brains before putting 'branded' victims on display? According to a senior doctor from KEM Hospital who chose to stay off the record, it is a standard practice across forensic departments the world over to mark victims in this manner. While that may be the case, displaying these images publicly is certainly not a part of any forensic manual. That lives had been needlessly lost was bad enough, making this sort of spectacle reeks of a complete lack of sensitivity and respect for the victims and their kin. Railway minister Piyush Goyal said that the Indian Railways will take up the broadening of foot-over bridges on a priority basis and audits will be conducted at several Mumbai stations. Twitter users, meanwhile, were unsparing in their criticism as commuters had complaint in the past too about the bottle-neck sitation at the high-footfall station. Many people pointed out that this was a tragedy waiting to happen. In a blistering attack on its ally the Bharatiya Janata Party (BJP), the Shiv Sena on Friday termed the stampede in which 22 railway commuters were killed as a "public massacre". Shiv Sena MP Sanjay Raut slammed the BJP for the much-touted Bullet Train project and said commuters' safety and security must be accorded top priority. Twenty-three year-old Anuj Kumar, who works as a tailor at Parel, left Kurla station at 10 am. However, he got stuck on the staircase. He said that a lot of people fell unconscious. However, he escaped from behind. As the South Mumbai MP, Shiv Sena leader Arvind Sawant had raised the issue of the structural problem associated with the Elphinstone Road station bridge. 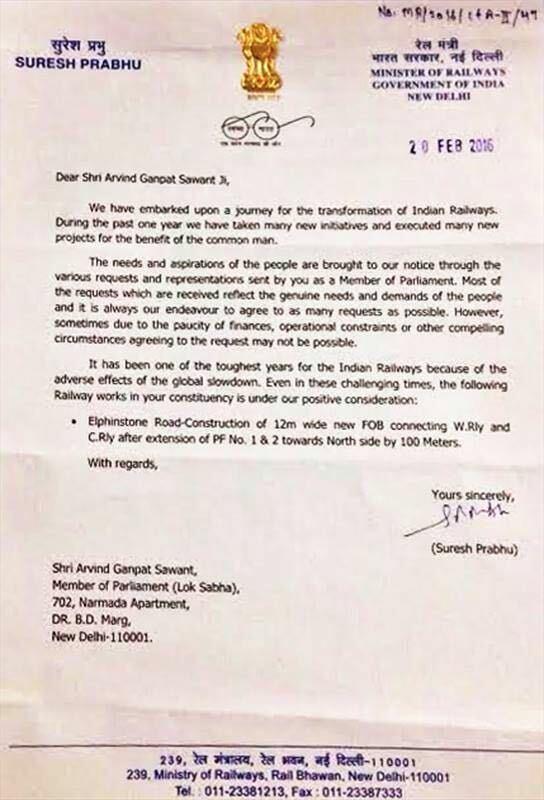 In a 2016 letter, then Railway Minister Suresh Prabhu had also lauded his efforts at bringing Indian Railways attention to the perennial problem. However, the letter itself pointed out that due to the paucity of financial resources, the issue does not get enough attention. Ruful Amin, 22. works at Indiabulls Centre. "I got in from Kurla and got off at Parel. I got pushed on the overbridge. I was pushed and three women and two boys died in front of me. I extricated my feet from the dead. I held on to railing and fell off. A man helped me. I fainted but there were no ambulance. People carried me while crossing tracks. I was taken in a police van and brought here to KEM. 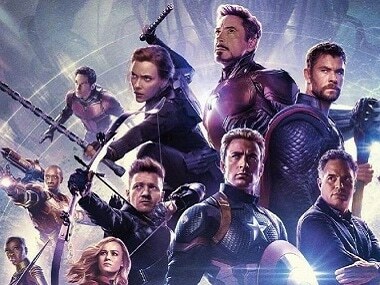 I felt I would die," he said. Will Goyal keep his word? While Goyal has now promised to widen the foot-over bridges across Mumbai Suburban Railway system, the demand for such a move was previously made in a 2015 CAG report, which specifically highlighted the structural default in the Elphinstone Road station bridge. Mina Walekar, 34, worked at Kamgar Kalyan Nigam. She stayed at Ulhasnagar. She was coming to work but got caught in the stampede. Her friend called her phone but a police constable picked the call informing that she was dead. Her friends have identified the body. "Foot Over Bridge (FOB) of six meter width was required to be provided at all suburban stations. FOBs of the prescribed size of six meter width had not been provided at all at five stations." A 2016 CAG report had said that the Foot Over Bridge is structurally weak. The report also said that the size of Foot Over Bridge was also not in line with the prevelant standards across the world. but no action was taken on the CAG report. According to CNN News18, the size of the FOB is not over 70 inches. The Axis Bank employee was a CA. She stayed at Ghatkopar. Her family got a call saying that she had fractured a foot. Her aunt came to the hospital but couldn't find her name in casualty list or dead list. They identified her from a picture. 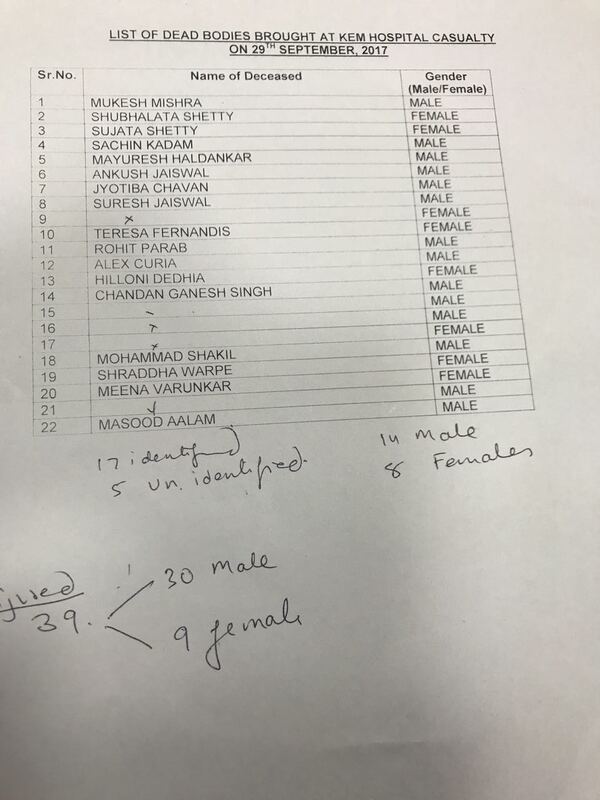 This is because name list is only of those who are identified. They are waiting for the body to be taken home. "We will order highest level of enquiry under Chief Safety Officer. there will be a capacity and safety audit of stations. We will give more importance to safety now. I have spoken to authorities.The dead will get Rs 5 lakh from the ralway, while seriously injured will get Rs 1 lakh," Goyal said. Sudhir Mishra, 30 year old labourer, went to book his ticket and got caught in the stampede. He is admitted to ICU now. A 22 year old woman, Hiloni Dedhia, who was employed with Axis bank is also believed to be dead. Her phone and bag were recovered from the incident site. Her father has reached KEM to identify body. 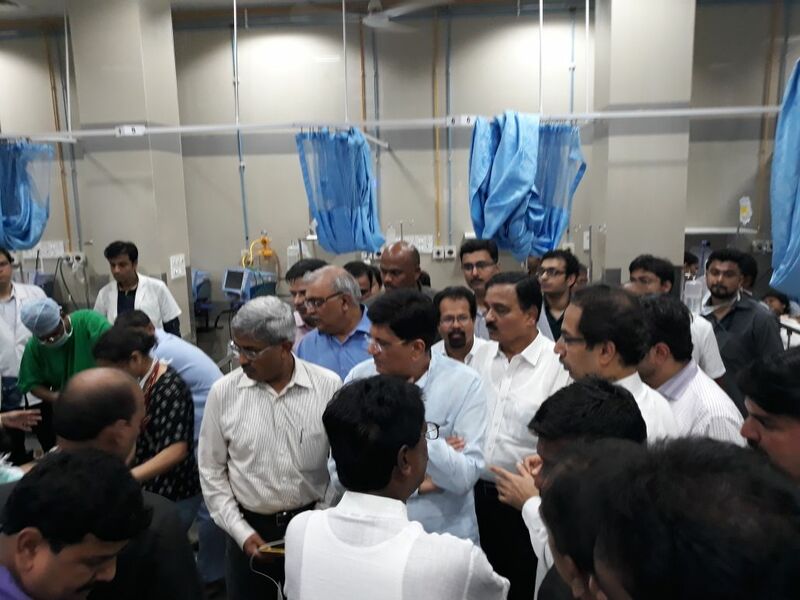 After visiting KEM Hospital, where the dead and the injured are being treated, Railway Minister Piyush Goyal is set to visit Elphinstone Road, the accident spot. 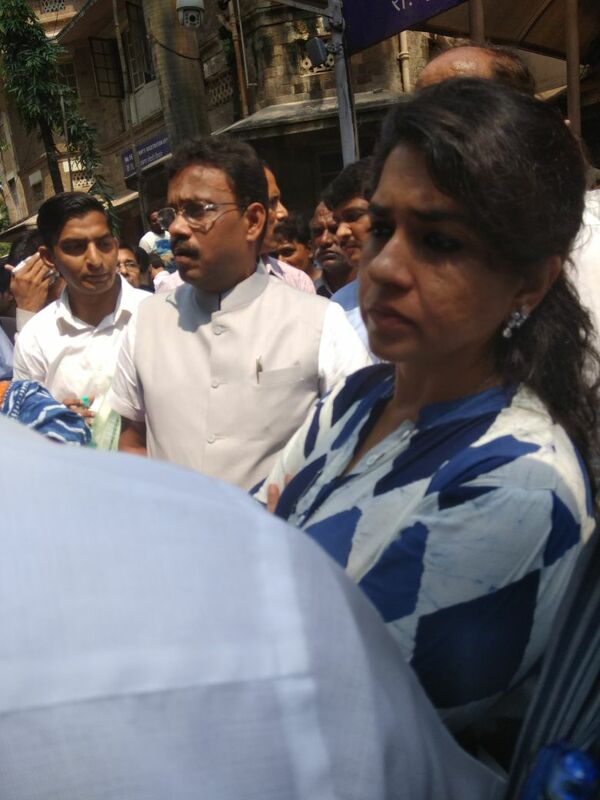 Senior BJP leader and state education minister Vinod Tawde is currently at KEM Hospital. Union Railway Minister Piyush Goyal reaches Mumbai and addressed the media: "This is a very sad day and the accident that happened at the Elphinstone Road Station is extremely worrisome. I have ordered a high-level enquiry into the matter," Goyal told media gathered outside the Mumbai International airport on Friday. Maharashtra chief minister Devendra Fadnavis ordered a probe into Friday's tragedy which killed 22 people. 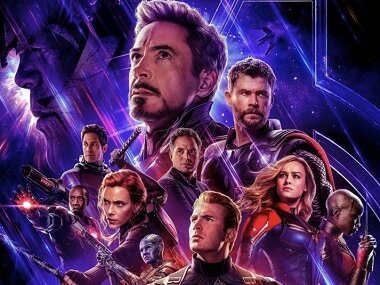 The chief minister tweeted out saying, "Enquiry will be conducted by Government of Maharashtra and Ministry of Railways and necessary, strict action will be taken." Eleven-year-old Rohit Parab was the youngest of the casualties. According to his parents, he had gone with his older cousin to buy flowers and was on the bridge at the time of the stampede. When the parents tried to call him, the cousin picked up the phone, but it got disconnected. They could not get in touch with him again and so, they came to KEM Hospital to check if his name was on the casualties list. An eyewitness, Ajay Ghate, a Network18 employee, was at Elphinstone Road Station during the time of accident. According to Ghate, the chaos at the foot-over bridge started due to rumours of short circuit then later that the bridge had collapsed. People panicked and in the rush to get off the bridge, caused heavy casualties. People were stranded on northern side of the Elphinstone bridge and the staircase towards the Dadar end due to sudden gush of heavy rains. As the crowd on the bridge showed no signs of dissipating, people started breaking the galvanised sheets along the bridge and threw several of the injured people down the bridge so that they don't suffocate and die. According to Ghate, who was on the bridge, atleast 7-8 people died on the spot. There were just 2-3 RPF staff to help the injured people at the time of stampede. Police officials came to the spot almost 45 minutes after the incident. 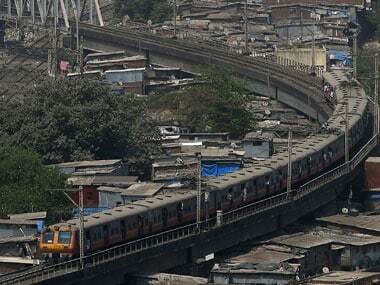 Modi tweeted and said that railway minister Piyush Goyal is in Mumbai to take stock of situation. According to Western Railway, a medical team is assisting KEM Hospital in treating injured at the North foot-over bridge at the Elphistone Road. Commuters, who survived Friday's stampede, were angry at the shoddy condition of stations and foot-over bridges in the city. 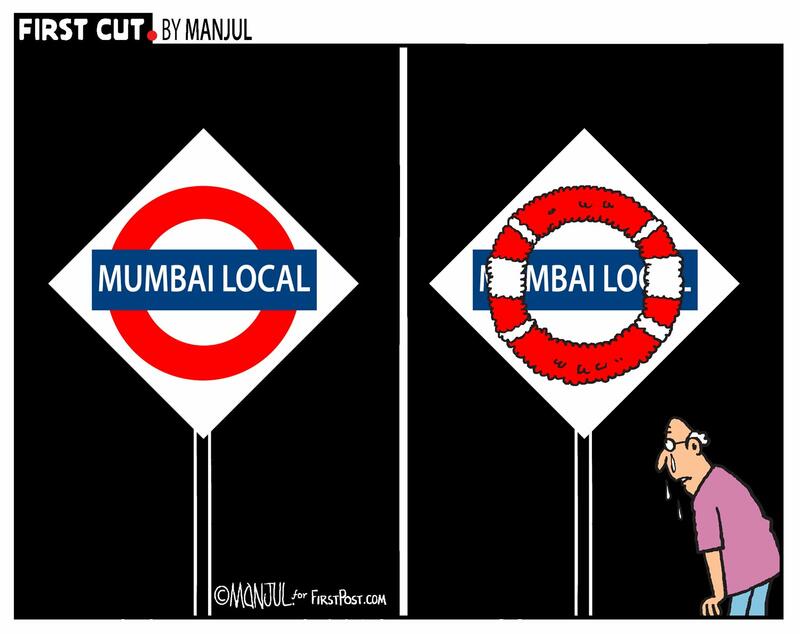 In a city, where local trains are the lifeline for daily commuters, how can the government be so lackadaisical, asked angry commuters. Many raised slogans against Union Railway Minister Piyush Goyal. "Piyush Goyal haye haye." According to IBN Lokmat, death toll has now risen to 22. According to reports among those dead are 18 male and 4 female dead. According to Firstpost reporter Sanjay Sawant present at the spot, 20 to 25 people are seriously injured among dozens who were hurt during the stampede on Friday. Firstpost spoke to a Disaster Management official present at the scene who said that at least 6 to 7 people have sustained serious fractures. Four of those injured have been shifted to the KEM Hospital. The official told Firstpost that the current death toll has risen to 15. Miitesh Jethva, a regular commuter told Firstpost that sudden rains caught commuters by surprise which triggered panic at the foot-over bridge. "There is usually a huge rush at the station everyday, but because of the rains people wanted shelter and there was a sudden huge rush at the bridge. In no time, People soon started falling over each other like dominoes. The incident happened at 10.45 am." According to TV channels on spot, the narrow bridge at the Elphinstone Road, which is decades old, can hardly manage the traffic on regular days. On Friday, heavy rains in the morning triggered chaos which ended up in a stampede. According to CNN-News18, the Railways had then cleared the construction of a new bridge, even sanctioning Rs 11.8 crore to this end. 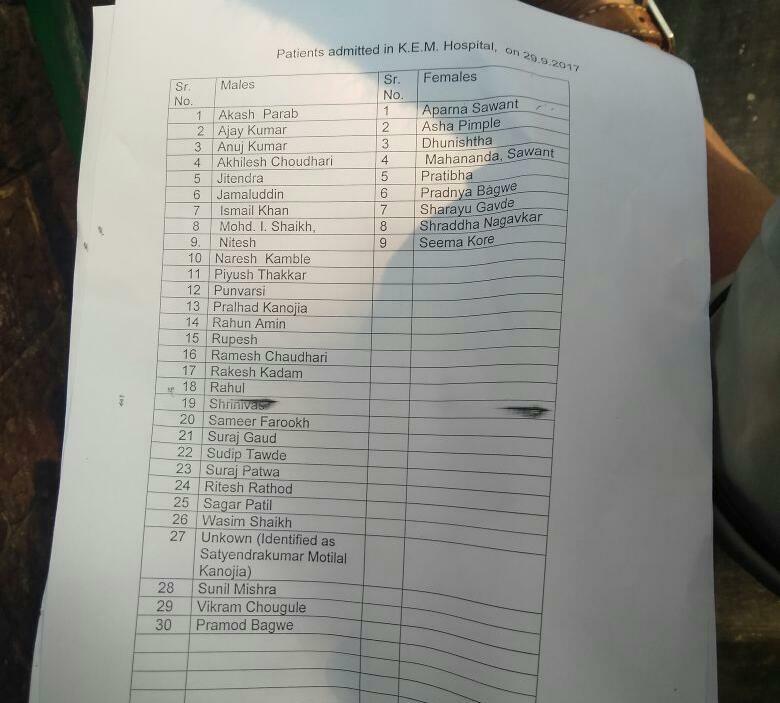 Mumbai: KEM Hospital says it has received enough blood to take care of the injured in the #ElphinstoneStampede. Thank you, city. Nobody uses this bridge because it exits on the east side while the crowd goes towards the west side which is the new business district. Condolences to the families of commuters who lost their precious lives. In a Dussehra-eve tragedy, at least 22 commuters were killed in a stampede on a narrow railway footover bridge connecting the Parel-Elphinstone Road stations of Western Railway here on Friday morning, officials said. At least 32 others were injured, many critically, and casualty figures could go up, the BrihanMumbai Municipal Corp (BMC) Disaster Control said after the morning peak hour tragedy. "We have ordered a probe into the circumstances leading to the massive tragedy," Maharashtra Education Minister Vinod Tawde said. Following the incident, Goyal cancelled his inaugurations plans. Mumbai Mayor Vishwanath Mahadeshwar, who visited the scene, said it was the responsibility of the Western Railway authorities to ensure commuters' safety. The festival-eve calamity sparked off angry reactions on social media, with many questioning lapses vis-a-vis safety and security of commuters even as mega-projects like Bullet Trains are announced with fanfare.